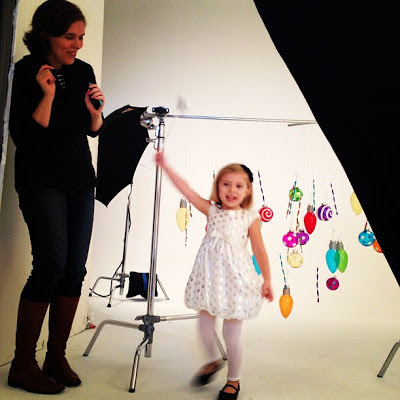 A few weeks ago, Millie and I had a very fun morning dressing up and being girly, thanks to Target and Tend by Glam. I love that this child can pretend to be a dinosaur, growl like a tiger, scale a jungle gym... and dress up like a princess. That's my girl! When I told her that playing dress up would be the focus of the day, she was so excited. Oh, and being driven to the photo shoot was an added bonus (pretty awesome for a city kid whose usual mode of transportation is her own two feet and the MTA). I've purchased quite a few "play clothes" for the girls at Target, but wasn't familiar with their dressier line for children. When we got to the photo shoot, a back room was set up with racks of clothes to choose from -- so fun! A stylist was on hand to help pick outfits, though Millie immediately zeroed in on a little white and silver polka dot number when she entered the room. The material was silky and smooth and she was immediately in love with her "princess dress." Combined with a cool headband, matching shoes and tights and she was ready to go. With our second outfit choice, Millie went totally glam. We're talking awesome tutu skirt with leggings (you can see more of it here, including the VERY affordable price tag! ), faux fur jacket and adorable shirt with embellished bow. I loved the accessory offerings, too... Millie picked out some bracelets and the flower bow in her hair. With an outfit like this, we could have hit the playground then jumped across town for tea at The Plaza. That's one of the most pleasant surprises of this collection -- you're dressed up but totally comfortable at the same time. We all know kids will LET YOU KNOW if they're not happy with what they're wearing, and I'm happy to report that was not the case here (though a special shout out must be given to Mr. Bear below -- he really knew how to keep the little miss smiling for the camera). I'm not gonna lie. I had just as much fun as Millie at the shoot (maybe even more...ssshhh...) At 3 years old, Millie is just starting to exert her opinion when it comes to clothing. It can be a fun AND frustrating experience getting her dressed in the morning, but I am trying my hardest to let her start making these decisions on her own. Being confident and self-assured starts on the inside -- and looking good on the outside comes with a little extra help from Target. Brand Statement: A big thanks to Target for sponsoring this campaign. Click here to see more of the discussion. She's a glamour girl all right! Posing like a pro already!